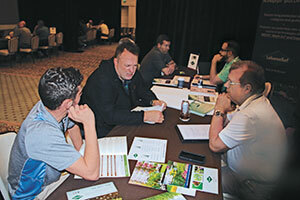 Now in its eighth year, the LM Growth Summit is unique in the industry in that it brings lawn care professionals face-to-face with some of the industry’s leading innovators. Sure, the opportunity exists to schedule these meetings at national or regional trade shows. But good luck successfully making 10 meetings with top level executives — let alone the owners of the companies or the actual inventors of the equipment — at any trade show. The LM Growth Summit is designed so that every attendee meets with every partner, period. Attendees also liked the event’s organization. No wandering allowed at the LM Growth Summit — there are too many meetings to be made. 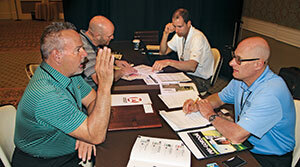 Attendees are each given their own specific schedule of one-on-one meetings with the 10 different partners, ensuring every lawn care professional learns about how each partner can help his or her business. This year 20 different companies accepted invitations to attend the LM Growth Summit. While it’s not as good as attending in person (lawn care professionals interested in attending can apply at LMGrowthSummit.com), we present our own one-on-one meeting with each partner in this feature story. 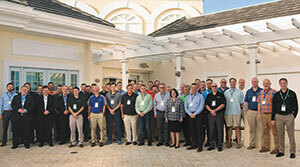 Only one company has been to every LM Growth Summit, and that company is PermaGreen. Dan Shiplov, new product sales consultant for PermaGreen, says the one-on-one meetings are what bring the company back every year. 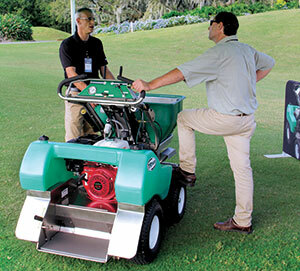 Shiplov was outdoors allowing attendees to take PermaGreen’s spreader-sprayer for a test drive. His focus was to point out the different ways the machine can maximize an operator’s efficiency. One of the newer features to increase efficiency on the Triumph spreader-sprayer is a break-through applicator, which combats clumping in the hopper. Another feature is the machine’s mechanically regulated spreader-sprayer system. 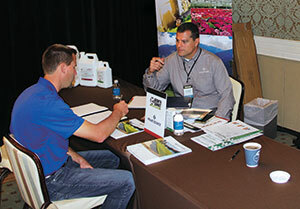 A funny thing happened before the LM Growth Summit began when one of the attendees emailed Brian Walker, area sales manager for Ewing Irrigation & Landscape Supply. The attendee politely declined the meeting with Ewing, Walker recalls, because the attendee didn’t do any irrigation installation. “I emailed him back and said, ‘If you think all we do is irrigation, then that is exactly why we need to meet,’” Walker says, laughing. Walker took the time to tell all the attendees about Ewing Irrigation & Landscape Supply’s culture and how the company goes about business. And for the attendee who wanted to skip his meeting with Ewing? Thankfully he took the meeting, because Walker had an important message for him. 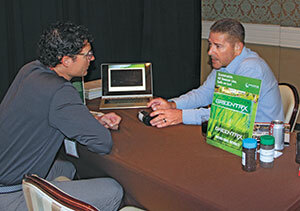 George Kinkead, president of Turfco, says he enjoys visiting the LM Growth Summit because of the attendees. They’re people he enjoys talking to, he says, because they are all hungry to grow their businesses. 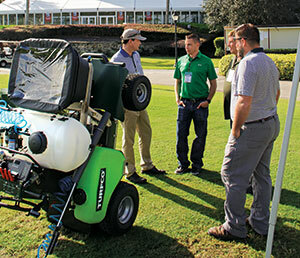 Turfco was giving demos of its T3100 spreader-sprayer to attendees, and while Kinkead was presenting the machine’s various features, his main talking point was that his company wants to help them grow their companies. One of Kinkead’s solutions to increase efficiency is the ease of operation of the T3100. North Carolina-based Prime Source is an entrepreneurial marketing company with a focus on developing, manufacturing and marketing select post-patent products, unique technologies and specialty products. Its goal for attending the LM Growth Summit was simple: The team wanted to educate people about who they are and what products they have available. Prime Source has a broad portfolio of adjuvants, seed treatments, fungicides, herbicides and insecticides, and obviously the company doesn’t want any of those products being kept secret from customers. LebanonTurf produces fertilizers, grass seed and biological products to help lawn care operators create and maintain healthy turf conditions. Mike Bandy, product manager, and Jeremy Bigler, landscape channel manager, were discussing how the company’s ProScape products can help LCOs overcome labor challenges by combining or even eliminating applications. Bigler says the event kept him on his toes as the attendees wanted to pursue different topics based on geography and the scope of their business. 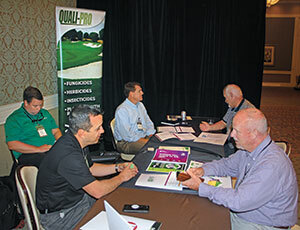 The men from Quali-Pro — Nick Strain, business manager, Jeremy Moore, national accounts manager, and Paul Fox, Florida area manager — were constantly on the move at the LM Growth Summit, not wanting to waste a single minute of the event. The attendees were all familiar with Quali-Pro, Strain says, but they were somewhat surprised to learn how big the company is. Some of the excitement from the group came from the new residential label on Negate, a sulfonylurea herbicide for broadleaf weed control in warm season grasses. Strobe Pro G was also a “big one” for the trio to talk about, Strain says. It’s said that one man’s trash is another man’s treasure. For the employees of Anuvia Plant Nutrients, that trash isn’t just a treasure, it’s also an environmentally friendly plant nutrient. Chuck Barber, vice president of customer accounts, specialty, explained to LM Growth Summit attendees how Anuvia takes organic waste and changes it into something useful that lawn care companies can be proud to use. Barber says that while he was there to educate the attendees, he also spent an equal amount of time learning from the attendees. The one thing that stood out to Barber was the willingness of the attendees to learn about a new technology. 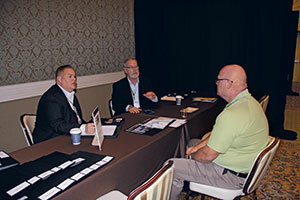 Shawnee, Kan.-based PBI-Gordon Corp. came to the LM Growth Summit with a common question for attendees: If they could have an ideal product, what would that product look like? A product that came up frequently was the company’s Avenue South, a broadleaf herbicide that is safe to apply in St. Augustinegrass and other sensitive warm-season grasses. Avenue South controls clover, dollarweed, spurge, dandelion and Virginia buttonweed, among many others. 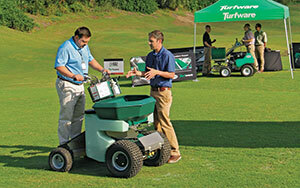 Rob Edwards is the vice president of operations for Turfware, but he is quick to point out that he is not your typical salesperson. That’s because Edwards is not only a former lawn care operator, but he’s also the co-inventor of TR360 ride-on spreader-sprayer. Edwards says the first thing he always points out about the TR360 is how it is “simply built,” making repairs easy. “I’m genuinely proud of that,” he says. The next thing that most attendees wanted to learn more about was the machine’s dual hopper, which allows operators to carry two different materials to job sites at the same time. The person next to you is not going to be the same person in three hours once we go through this process, Bogard said. He then led the lawn care attendees through the six components of the Entrepreneurial Operating System (EOS) — vision, people, data, issues, process and traction — outlined in the book “Traction: Get a Grip on Your Business” by Gino Wickman. Bogard, a professional EOS implementer with Nexus Business Solutions in Grand Rapids, Mich., works with companies to integrate the EOS into their operations. At the Growth Summit, he challenged attendees to identify their one-year, three-year and 10-year goals, evaluate their employees and build a strong leadership team. All attendees walked away having started their one-page plans — their roadmaps to creating “traction” and changing their companies for the better. For LM readers who didn’t join us at this year’s Growth Summit, we’re giving away copies of “Traction: Get a Grip on Your Business.